A week ago I made a number of quiches to feed Ladypants' vegetarian parent folk. No bacon in the pie shells this time. Ladypants makes the best pie crust in the outer rim, but on this occasion flat out refused to make some. Something about yarn and feeling it being more important. I dunno. So I bought tenderflake crusts. They'll have to do in a pinch. Serve with a salad for a light lunch. 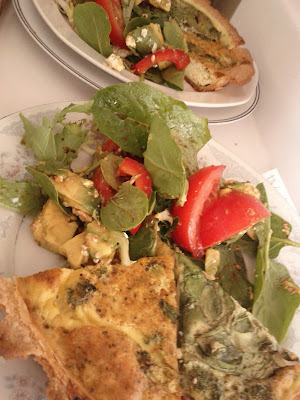 Quiche is easy. For two tenderflake pie crusts, whip up 8-10 eggs depending on how much other stuff you put in. Add 3/4C - 1C buttermilk and season with salt and pepper. This is where the fun begins. To further flavour the egg mixture, you can add any herb or spice you want. For one batch, I added an Indian spice mix that I got in my christmas stocking. That was my favourite of the mix. 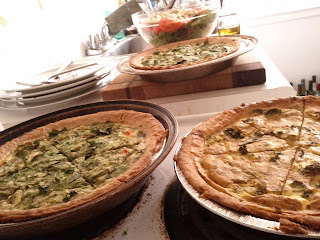 Indian quiche, who knew. To the others I whisked in some basil pesto. Add vegetables, meat and/or cheese to the pie crusts individually. Mixing them into the eggs will make for uneven distribution and messy pouring. I used broccoli (just small cut florets), feta cheese, baby spinach and red pepper. Bake at 375 degrees for about 30 minutes or until the middle is set. I don't like my eggs runny in quiche.